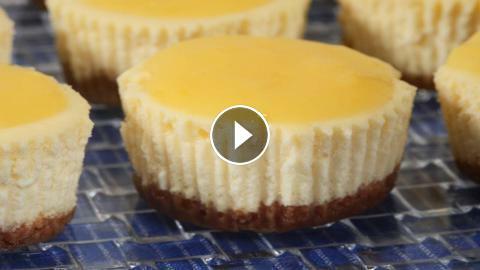 Recipe here: These Lemon Cheesecakes have three layers. Each individual cheesecake starts with a Graham Cracker Crust. Next, is a creamy smooth and dense cheesecake filling. The topping is a deliciously tangy sweet lemon curd. I especially like how the tanginess of the lemon curd offsets the richness of the cheesecake filling.